My husband Zach has been doing up Passover big the past couple of years. 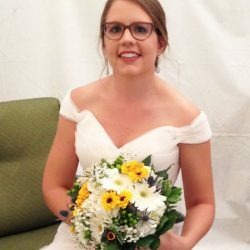 Before we were married, I would quasi-host a friend seder with him and his roommates (e.g., I would direct guests to the water pitcher and make sure we bought enough food). We were so busy last spring that we did not host a seder in our house, but we’re making a point of going big for our first married Passover. I like the communal aspect of Passover—who doesn’t like a holiday oriented around a dinner and multiple cups of wine? Our 2016 Seder plate, with bowls that Zach’s mom Roberta made for him. Photo by Jaclyn Yeary. The past few years have been really interesting to observe how our families have been interacting with each others’ religion. My sisters, parents and grandparents have been interested to learn more about Jewish holidays, and we’ve done some Hanukkah games together and explained Rosh Hashanah and Yom Kippur. But Passover offers an opportunity to share in a service outside of a synagogue, making it feel more accessible to the those who are not Jewish. Prayer and storytelling around a meal is a perfect time for learning and creating understanding. So when we decided to come visit my Catholic family for Easter, we asked them about doing a seder together the day before, and they agreed. My mom is already planning the menu. 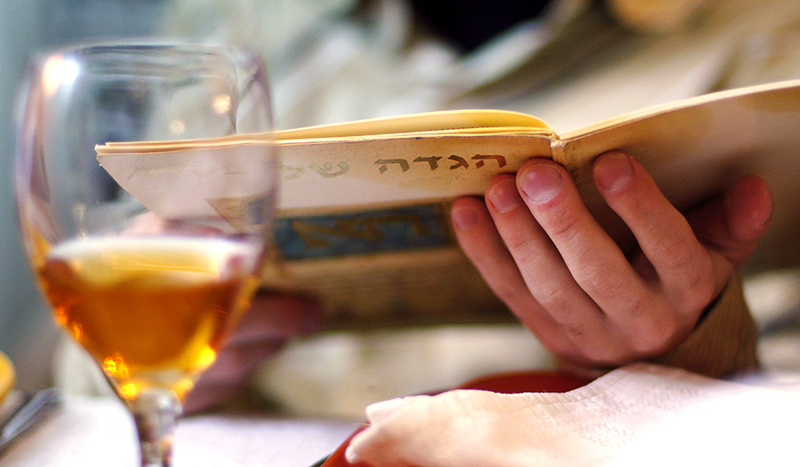 Here are a few considerations for planning a seder for an interfaith audience. 1. Consider the timing of your seder. We decided to do a seder with my Catholic family the Saturday before Easter because it worked the best with our travel plans. It was also a good date because this year, the Friday before Easter is a solemn day of fasting for Catholics. I have attended seders on Good Friday in the past, but this year I’m trying to be more mindful of the fasting aspect (see my recent blog post here), so I wanted to avoid this day if we could. I know that there’s a lot of history behind why these two holidays are celebrated close together, and that some feel that Christian holidays overshadow the Jewish ones in the U.S. and elsewhere. I do not contest that. Zach and I have maintained respect for each others’ traditions by making it personal—he wants me to live my best life and I want the same for him. So we consider what the other needs. 2. Pick the right menu. Zach’s family haggadah. Not pictured: the additional photocopies we will use. 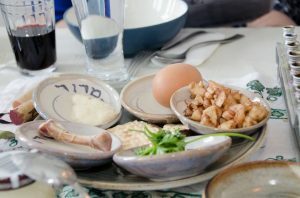 The first thing my mom asked about the seder is, “What is the menu?” She was familiar with the idea of a seder plate, but unsure of how it related to the seder meal and what kinds of foods were allowed. We explained that we would pick a menu free of bread, rice, pasta, pork and shellfish, which still leaves us with plenty of options. And, of course, matzo ball soup. (P.S. I’m looking forward to trying this recipe for Roasted Tomato Soup with Ricotta Matzo Balls from InterfaithFamily). We’ve hosted friend seders in the past, and will likely host one this year, where a few friends have been vegetarian. This puts a further constraint on the menu but it can be a fun excuse to make something new for everyone to try. If you want to go through more of the service for a seder, having a guidebook for your friends or family to follow along will enrich the experience. 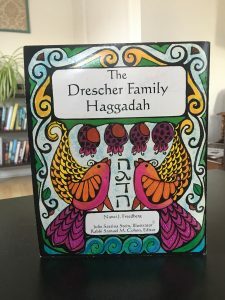 Zach’s family has some beautiful haggadahs with the family name that they use each year. One year, Zach brought one of them back with him and photocopied a bunch of pages, so that our friends (and I) could follow along at his friend seder. Being able to participate makes everyone feel welcome, which is another reason why Passover is a very accessible holiday for interfaith family and friends. For the seder with my family this year, we’ll bring some of these photocopies along, but we’re looking at investing in some new family haggadahs for future seders like this one. Sharing this interfaith experience with my family has been truly incredible. While Zach is Jewish and I am Catholic, traditions like a Passover seder with family and friends are our opportunity to create spaces where both of us, and both of our families, feel truly part of the celebration. Our seder feels like ours, owned and cherished by both of us.